Typhlitis. Marked low-attenuation cecal wall thickening (large arrow) with moderate pericolonic inflammatory stranding (small arrows). Note thickening of transverse colon wall posteriorly. Typhlitis. Marked asymmetric cecal wall thickening (arrow) in this 64-year-old patient whose status is postchemotherapeutic for lymphoma. 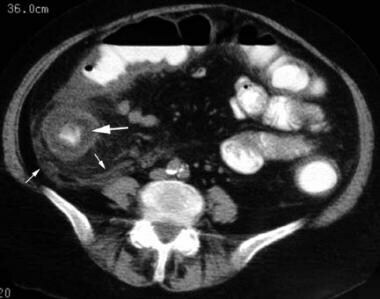 Abdominal computed tomography (CT) scanning with oral and intravenous contrast is the preferred examination. The maximum normal colonic wall thickness on CT scan is 3 mm. When the colon is distended with stool, fluid, or oral contrast, the normal colonic wall is nearly imperceptible. Pericolonic fat should demonstrate homogeneous fat attenuation. Plain radiographs are nonspecific but may demonstrate a fluid-filled, masslike density in the abdominal right lower quadrant (RLQ), distension of adjacent small bowel loops, and thumbprinting. 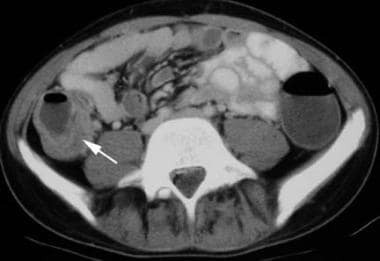 Free intraperitoneal air and pneumatosis coli rarely are observed. Barium enema and colonoscopy are contraindicated in possible typhlitis because of perforation risk. Plain radiographs may suggest abnormality but are nonspecific. Confirm abnormal findings with CT scanning. Typhlitis. 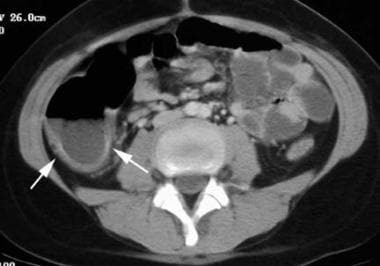 CT of this 10-year-old patient with leukemia demonstrates fluid within the cecum, which has an asymmetrically thickened wall (arrows). Typhlitis. Mild, asymmetrical, low-attenuation cecal wall thickening (arrow) in an 8-year-old patient with leukemia undergoing chemotherapy. Typhlitis. Marked circumferential cecal and ascending colon wall thickening (large arrows) with mild pericolonic inflammatory stranding (small arrows). CT scanning readily identifies complications, including pneumatosis coli, pneumoperitoneum, pericolonic fluid collections, and abscess. These complications may require urgent surgical management. CT scan findings consistent with typhlitis in a patient with an appropriate clinical scenario result in a high degree of confidence in the diagnosis of typhlitis. The above findings, combined with an appropriate clinical history, indicate a high probability of typhlitis. CT scanning may be indicated to exclude perforation or abscess (not visualized on ultrasonography) and to establish a baseline to compare follow-up studies. 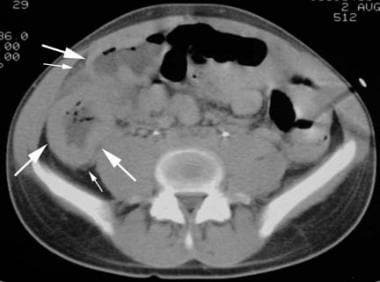 RLQ small bowel loops distended with air can produce a significant ring-down artifact on ultrasonograms, thus obscuring visualization of the right colon. 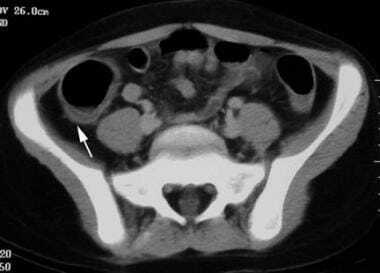 Bierman HR, Amronin G. The ileocecal syndrome in the leukopathic conditions. Clin Res. 1960. 8:134. Haut C. Typhilitis in the pediatric patient. J Infus Nurs. 2008 Sep-Oct. 31(5):270-7. [Medline]. Abu-Hilal MA, Jones JM. Typhlitis; is it just in immunocompromised patients?. Med Sci Monit. 2008 Aug. 14(8):CS67-70. [Medline]. Robaday S, Kerleau JM, Tapon E, Levesque H, Marie I. [Typhlitis: report of a case and review of the literature]. Rev Med Interne. 2008 Mar. 29(3):224-7. [Medline]. Altınel E, Yarali N, Isık P, Bay A, Kara A, Tunc B. Typhlitis in acute childhood leukemia. Med Princ Pract. 2012. 21 (1):36-9. [Medline]. Shafey A, Ethier MC, Traubici J, Naqvi A, Sung L. Incidence, risk factors, and outcomes of enteritis, typhlitis, and colitis in children with acute leukemia. J Pediatr Hematol Oncol. 2013 Oct. 35 (7):514-7. [Medline]. Frick MP, Maile CW, Crass JR. Computed tomography of neutropenic colitis. AJR Am J Roentgenol. 1984 Oct. 143(4):763-5. [Medline]. Alexander JE, Williamson SL, Seibert JJ. The ultrasonographic diagnosis of typhlitis (neutropenic colitis). Pediatr Radiol. 1988. 18(3):200-4. [Medline]. Glass-Royal MC, Choyke PL, Gootenberg JE. Sonography in the diagnosis of neutropenic colitis. J Ultrasound Med. 1987 Nov. 6(11):671-3. [Medline].